The GBP/USD lost about 0.7% over the first week of February as the economic fundamentals in combination with Brexit uncertainty amounting weighed. 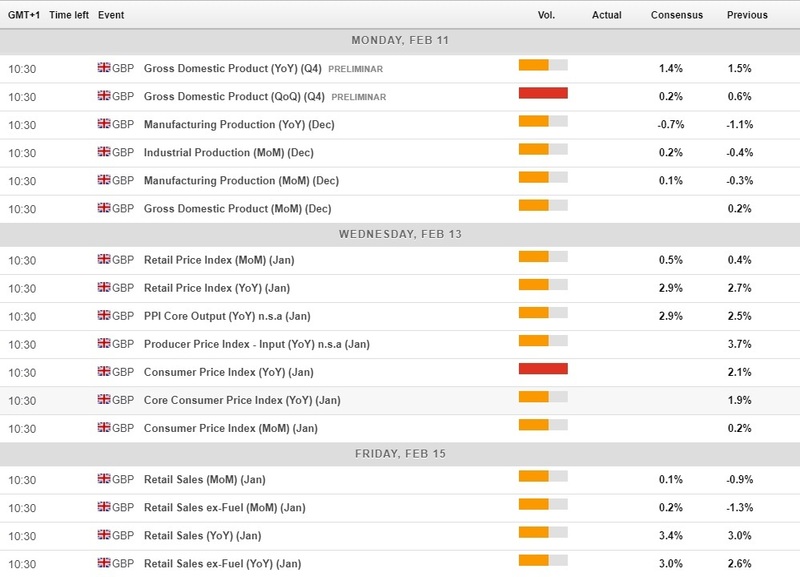 The forward-looking indicators saw services activity slump at the brink of recession in January. The Bank of England lowered the UK growth forecast due to Brexit uncertainties as businesses are holding back the investment. The GBP/USD broke below key support zone of 1.3030-1.3000-1.2970 and it is expected to remain subdued over the second week of February as growth is seen faltering and Brexit deal is unlikely to be passed next week. The GBP/USD slid about 0.7% to mid 1.2900s over the first week of February after the UK forward-looking indicators saw the economic activity slumping lower and the Brexit was going nowhere over the week. Reasons for the GBP/USD to slide lower are combined. The Brexit going nowhere, the deterioration in the economic indicators and the technical factors favoring the pullback on GBP/USD. The combination of the same factors is expected to prevail also during the upcoming week. The UK Prime Minister Theresa May held a meeting with the European Union top officials on Thursday, but there was no progress in the loathed issue of the Irish border backstop. The UK Prime Minister Theresa May will reach her own deadline for finishing the Brexit agreement on February 14. The UK Prime Minister Theresa May and the European Commission President Juncker will meet again at the end of February, less than a month before the UK is scheduled to leave the EU. The EU leaders would have to get together to approve any changes to the deal, and the British and European parliaments would still have to vote on it. It is becoming clear that a postponement of the UK’s departure from the EU is inevitable. 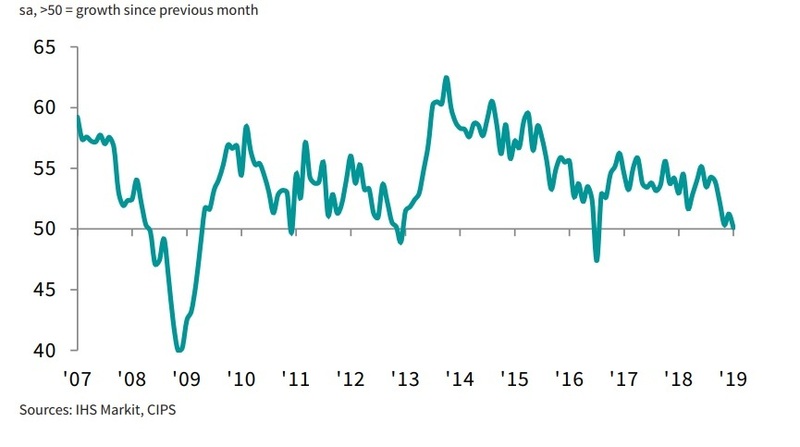 The set of January PMI data pointed to the general slowdown of the economic activity in the UK at the beginning of 2019 reflecting the Brexit uncertainty. The UK manufacturing PMI rose less than expected to reach 52.8 in January and construction PMI dropped to 50.6 in January from 52.8 in December. The services PMI published on Tuesday also fell below the expectation standing at the brink of recession with a reading of 50.1 in January. The deterioration in the UK economic activity combined with Brexit stalemate is weighed on Sterling that broke the major support lines at 1.3030-1.3000-1.2770. The other factor weighing on the GBP/USD was the Bank of England cutting the growth forecast for the UK economy lower in the February release of its Inflation report last Thursday. While the initial currency reaction was Sterling negative with GBP/USD falling to last week’s low of, Sterling managed to recover by the end of the day to 1.2990. 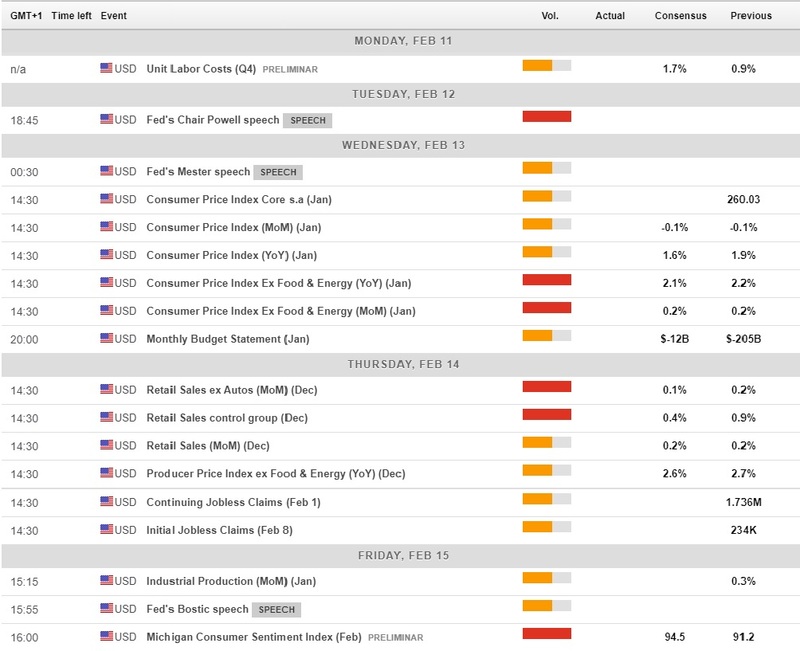 On the other hand, the US economic calendar will feature retail sales and inflation data while the US is fundamentally in a different position with the Fed officials praising the strength of the US economy. Technically the GBP/USD is moving within a corrective trend after breaking the psychologically important 1.3000 and 38.2% Fibonacci retracement line of 1.2970 on Tuesday. The technical oscillators like the Relative Strength Index (RSI) and Slow Stochastics (SS) are both pointing lower with Slow Stochastics making a bearish crossover in the Overbought territory indicating future price declines towards 1.2900 level representing a 100-DMA on a daily chart and 1.2800 representing 50-DMA on a daily chart next. On the upside, the 1.2970-1.3000 levels are expected to hold as a resistance line. Powell did not comment on monetary policy or economic outlook in remarks prepared for delivery at a session with teachers. Powell said the US economy is in a good place at the moment. The FX Street Forecast Poll is expecting Sterling to appreciated to 1.2995 next week, with 61% bullish forecasts compared with 39% of bearish outlooks. While the 1-month forecast is neutral expecting GBP/USD to remain at 1.2929, with 45-44% bullish-to-bearish forecasts and 11% sideways forecasts, the increased probability of delayed Brexit may change the outlook going forward. The vast majority of the forecasters in the FX Street Forecast Poll is bullish over the 3-months horizon with GBP/USD expected at 1.3120 with 61%-29% of bullish-to bearish forecasts and 10% of sideways predictions.